Tybolt’s a Deviant, a hated race immune to direct magic in a world where Wizards ensure survival. But when he loses his entire family to a spell-made storm he joins an elite group of Wizard hunters, organized beneath the new non-magic wielding king. Now eighteen, he spends his days capturing Wizards. But the nights are his, reserved to feed the starving villagers of Eriroc under cover of dark. There’s always more people in need than he can help, and one of these days he’s going to hang for theft from the royal kitchens. 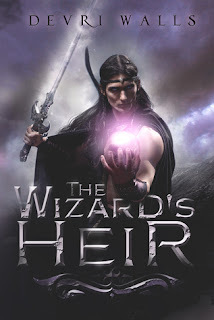 Although Tybolt and his fierce partner, Auriella, have imprisoned many Wizards, the one partially responsible for the storm that killed Tybolt’s family is still out there: Alistair. When an old informant claims to have information regarding their elusive prey, everything changes. In a cruel twist, Tybolt realizes he isn't who he thought he was at all. How can he save himself, the people, and those he loves while keeping his secrets safe? 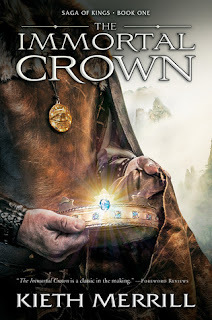 Can he hide his true nature and allow the corrupt king to remain on the throne? Or will he have to unveil himself and risk possible execution to save them all? Lots of really great fantasy elements weave their way through The Wizard's Heir. We have magic users, fighters, a beautiful lady that caught the eye of the evil king, and a hero ready to rescue everyone. There's a lot going on the world and sometimes it got a little rushed. There are rivalries and enemies that I don't quite understand how they began. Perhaps I'm too much of a series girl and just like to always know more. The middle was my favorite part. As Tybolt realizes his past and what that means for his future, there are some really great scenes that are incredibly well written. But then we move into chase scenes that seemed to be filler, that just didn't seem to actually move the story forward. Overall this was a fun read. I enjoyed it, but I think it needed a little more at some points and a little less at others. Two women's lives collide when a priceless Russian artifact comes to light. Tanya Kagan, a rising specialist in Russian art at a top New York auction house, is trying to entice Russia's wealthy oligarchs to bid on the biggest sale of her career, The Order of Saint Catherine, while making sense of the sudden and unexplained departure of her husband. 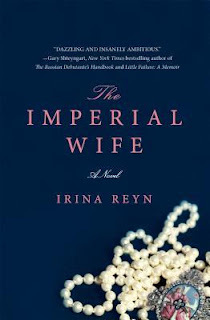 As questions arise over the provenance of the Order and auction fever kicks in, Reyn takes us into the world of Catherine the Great, the infamous 18th-century empress who may have owned the priceless artifact, and who it turns out faced many of the same issues Tanya wrestles with in her own life. The Imperial Wife follows two stories - one of modern Russian immigrant Tanya, and the other of Catherine the Great famous empress of Russia. I feel like these two stories were supposed to be more related than they I found them to be. Instead they came across as two stories that just happen to be told at the same time. Of the two stories, I found Catherine's to be much more interesting. In all fairness, her life has always fascinated me and I may be a little more biased in that direction to start with. Catherine's story was not complete, but ends as she takes control of Russia. It skips over some her of life, but hits on some very interesting point of time as she adapted to her new life in the Russian court. I loved every page of it. Tanya's story on the other hand just wasn't is interesting to me. I found myself wanting to rush through it to get to Catherine's. There are some very interesting pieces to her story, and her Russian clients were one of them. However, the relationship with her husband just didn't seem to justify her response in the end. In fact, the whole ending of her story just seemed off to me. I did enjoy the stories of her as a child, growing up and learning about America for the first time, trying to adapt to a new culture - much like Catherine did, and maybe this is why I enjoyed this aspect so much. Well written, and well researched. I had a hard time connecting to Tanya's story, but with the level of writing done by the author, I'm sure other's will be able to connect very well. 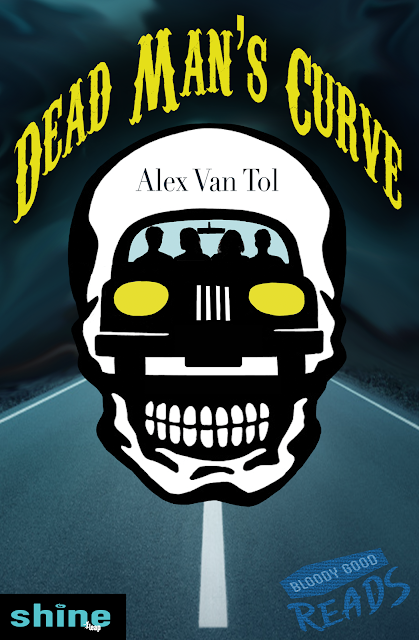 Watch for Alex’s Leap Books: Shine YA horror novella DEAD MAN’S CURVE launching fall 2016. When 18-year-old Booker accidentally runs over a mysterious figure on a wilderness highway, he and his passengers are forced to veer along a horrific, ever-shifting road to madness. Follow Alex via her website, and on Facebook and Twitter. High school changes everything for Kenzie Ryan and Angelo Sanchez—especially their relationship. After spending all summer cracking crimes against endangered wildlife in Big Pine Key, Florida, now they barely see each other. 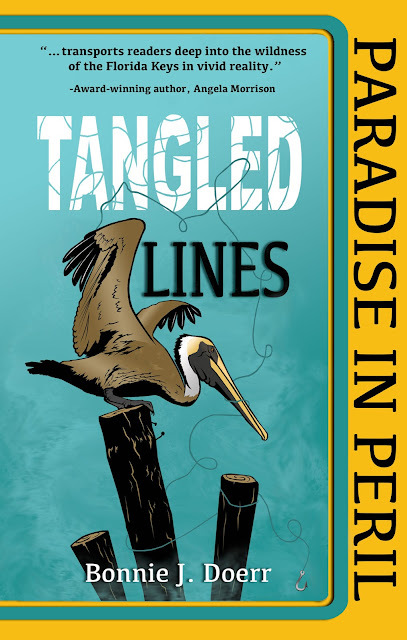 Angelo hangs out with a Porsche-driving quarterback and a stunning local “Conch princess” and Kenzie struggles with being a newbie among the Key West cliques. But high school drama gets over-shadowed when horrific numbers of pelicans are found tortured near the islands where they live. Kenzie begs Angelo to help stop the slaughter, but he refuses until a stunning family secret is revealed. Bonnie J. Doerr, an avid traveler, gardener, and nature lover, is the acclaimed author of eco-mystery novels for tweens. For over thirty years, she taught reading and writing skills to students of all ages—from kindergarten to college. Ms. Doerr enjoys sharing her ecological research, writing experiences, and educational insights with adults and children. Her work has been described as a “mashup of Jean Craighead George and Carl Hiaasen” by some and as a “teen detective series inspired by Nancy Drew and the Hardy Boys by others. Her work has been honored by NOAA (National Oceanic and Atmospheric Administration) with a grant for its use in environmental education and has been included in Milkweed Editions literary field guides. She lives in a log cabin on the edge of a historic park in North Carolina. Learn more about Bonnie at www.BonnieDoerrBooks.com. Follow Bonnie on Facebook, Twitter, and Instagram. A thousand years ago, the Navigator possessed thirteen stones touched by Oum’ilah, the God of gods. Over time, these power-ful stones of light were scattered and a prophecy arose declaring that a “child of no man” would gather them again, and he would be given immortality and reign forever as god and king of Kandelaar. The sorceress of the cult of she-dragon has chosen Drakkor, a warrior and mercenary who travels with bandits and a corrupt stone of darkness. The Oracle of Oum’ilah has placed his faith in Ashar, a young postulant who is unsure the stones of light even exist. Meanwhile, miles away, a slave named Ereon Qhuin dreams of freedom. Abandoned at birth, his only possession is a strange stone that he believes is the key to his destiny and freedom. A mercenary, a postulant, and a slave—which one is truly the child of prophecy? Who will wear the immortal crown? I love finding a good epic fantasy series to really dig into. The Immortal Crown has a lot of the elements I love to see. We start out with a prophecy - one that's changed over the years and over the miles. We even start with a hint of dragons. Eventually we follow several potential prophecy fulfillers as they journey into new parts of their life - from adventure to first tastes of freedom to potential love. There are sooo many characters, but each story seems to entwine itself in the overall storyline in an easy and memorable way. I didn't once have a problem remembering who was doing what and where they were in the journey. Some of the characters and lore were a little expected - the girl who prefers pants and is surprisingly good at swords, the ancient people who left a forgotten legacy, but it was done with just enough of a twist or with a little bit extra that it really made the characters stand out. I would have liked a tad more excitement. There are a few great moments, but I feel like I missed a bit of the "sword" in the "sword & sorcery" book.